The Laguna Reach of the Colorado River runs about six miles, between Imperial and Laguna dams just north of Yuma, Arizona. In the early 20th century, explorer and cartographer Godfrey Sykes mapped the Colorado River delta, showing the Laguna Reach as the beginning of the delta. The massive Colorado River delta—once covering some two million acres—is now little more than a vestige of its older self. In the past several years, however, restoration and rehabilitation efforts have begun in many portions of the remnant and former delta, including work in the Río Hardy and the Yuma wetlands. 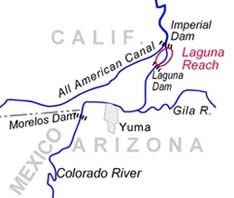 The Laguna Reach is now fed almost exclusively by sediment-sluicing flows from Imperial Dam and from the canal works on the river’s right and left banks. An average of more than 400,000 acre-feet flow through the reach each year, predominantly through the channelized wasteway. Overrun by thousands of acres of saltcedar, an invasive plant that crowds out native plants, the reach has very limited native riparian and marsh habitat. Despite this, the reach is replete with abandoned river channels, offering tremendous opportunity for restoration. The goal of the Laguna Riparian and Marsh Enhancement Project is to rehabilitate portions of the old river reach, replacing monotypic saltcedar stands with diverse habitats, ranging from open water through emergent wetlands, structurally complex stands of cottonwood and willow, and higher-elevation mesquite bosques. This diverse habitat will attract many of the migratory birds formerly attracted to the area,increase habitat for listed species such as Yuma clapper rails and black rails, and provide additional recreational opportunities. Further, a restored Laguna Reach will complement other downstream restoration projects and provide additional resilience for Colorado River delta species. 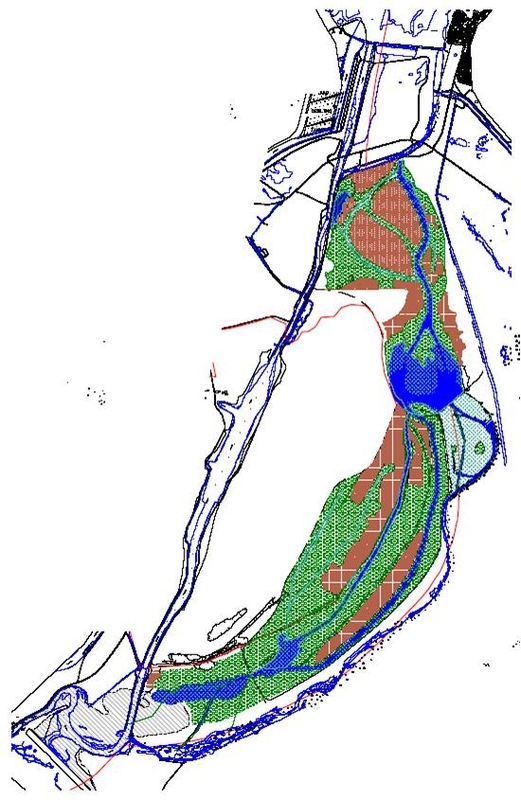 With the assistance of Natural Channel Design, Inc., the Pacific Institute released a conceptual plan in December 2007 for the rehabilitation of 730 acres in the Laguna Reach, with the potential for it to be expanded to include more than 1000 acres. In December 2008, the Bureau of Reclamation hired Natural Channel Design, Fred Phillips Consulting, and Shephard-Wesnitzer to develop detailed conceptual alternatives and cost estimates. In late May, 2009, the design team presented three alternatives to a large group of stakeholders, including the Pacific Institute, Reclamation, the Arizona Department of Game and Fish, the California Department of Fish and Game, the U.S. Fish and Wildlife Service, the Bureau of Land Management, and others. The project design includes up to 100 cfs of Colorado River water for project use. Because the proposed alternatives would replace existing saltcedar with other types of vegetation, and because the flows through the project area will be recaptured at Laguna Dam for delivery to downstream users, the projected total net water use for the most water-intensive alternative is only 200 acre-feet per year. To maximize water use efficiency, the project is designed to operate as a managed, leveed wetland (similar to those at the Yuma East Wetlands) with three water control structures. The three alternatives encompass 1000, 1050, or 1260 acres, with total costs ranging from $15.7-$20.2 million. The largest alternative(pictured right) would include 87 acres of open water, 169 acres of deep marsh, 238 acres of transition zone (including alkali sacaton, salt heliotrope, brittlebush, and saltbush), 401 acres of cottonwood-willow, and 365 acres of mesquite. On August 27th, the Laguna Reach working group met in Yuma to review the final revised alternative. This final concept plan scales back from the 1260 acre alternative selected by the working group in May, due to concerns from Reclamation’s Yuma Area Office that it encroached on the Laguna Settling Basin dredge disposal area and could hinder Reclamation’s ability to store dredge spoils in the future. On October 28th, the consultants presented a revised alternative to the Lower Colorado River Multi-Species Conservation Program Steering Committee. This revised alternative includes 65 acres of open water, 94 acres of deep marsh, 155 acres of ‘transition zone’, 401 acres of cottonwood-willow, and 342 acres of mesquite, exceeding MSCP’s habitat goals for this reach of the Colorado River. The total net water budget for the project is an estimated 100 acre-feet per year, reflecting the high water consumption rates by existing non-native vegetation in the area. The revised design also includes steady flows to the historic river channel, to provide some 80 acres of shallow rail habitat (included as part of ‘transition zone’ above), and an option for the Arizona Game and Fish Department to fund an inlet canal to increase flows and improve water quality to Mittry Lake. The MSCP Steering Committee unanimously approved a resolution supporting the restoration design and also unanimously approved a motion to increase funding for the project to $750,000 in the current fiscal year, to $1,400,000 in FY2011, and to $5,000,000 in FY2012. The project will continue to be revised in coming months, to reflect changes in the size of the sediment disposal area and suggestions from the Institute and other stakeholders. The Institute will continue to work with Reclamation and others, to maximize the size and habitat value of the restoration design. For more information about the Laguna Riparian Enhancement Project, please see the alternatives report or contact Pacific Institute Senior Research Associate Michael Cohen. Learn more about our Colorado River restoration efforts.